Thank you for your response to our post last week about letting go. I always love a new year because it gives us the opportunity to take an inward look at ourselves and think about how we spend our time. I think as I grow older, I realize more and more the little things in life are the things that matter most. By this point in our lives, we’ve usually mastered the big picture, but it’s focusing on the little details that make it a masterpiece. Whether it’s setting a beautiful table, monogramming pretty napkins, displaying a collection you love, or organizing treasured letters and notes you have saved for years—the things that give us great pleasure and bring happiness are the little things I am talking about. Not only for ourselves but for others as well. This year I want to enjoy flowers inside and outside. There is nothing dreamier than having a blossom on my desk or on my side table at home. Last year for Christmas, I received a flower as a gift. Our editor of TeaTime magazine put one on my desk every week last year. I always looked forward to that, and it changed my outlook. How refreshing and how restorative it was to enjoy those beautiful blossoms. 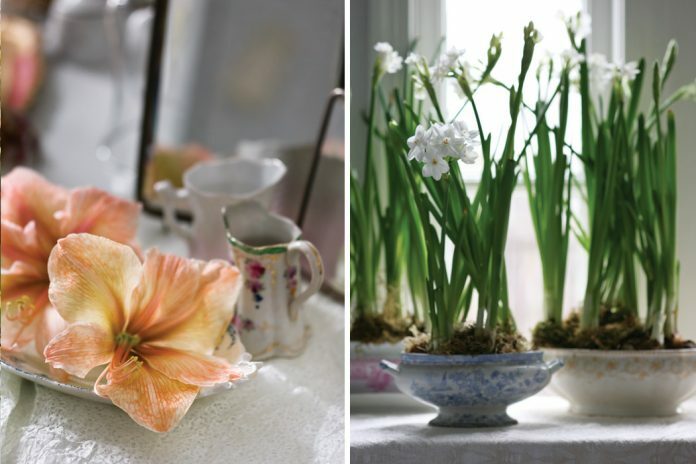 This post from Victoria magazine is great for winter flower inspiration. I think it goes back to the time when my twins were young boys. They would pick weeds, flowers, leaves, and anything that looked like a bouquet to them and bring it inside to me. I had little vases lined up on my windowsill where I could enjoy each little item. Those little dirty hands would hold up a tightly-clasped collection of their precious treasures, and we would put them in vases to display them. What joy! It wasn’t just the flowers; it was the reminder that they loved me and thought of me. Really that’s all anyone wants to know, isn’t it? How lovely it would be to brighten someone’s day with something as simple as a flower. I am going to start a series of posts during this year writing about the little things that make a difference in our lives. I hope you will respond with your ideas and thoughts. Please share Ribbon with your friends. We want to reach as many as possible. Together, we will challenge each other and will think about what’s important. Let’s celebrate every day to the fullest. What do you consider most important to you in life? 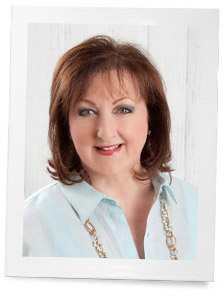 Thank you Phyllis for all of your blogs, new and old. I too so look forward to reading them and how others respond. Now that I am retired and my husband is partially so, I love waking up with him still by my side, having time to talk and plan. We cook together, as well as share the errands, etc. He too is very kind, opening doors, dropping me off at the front of buildings, doing laundry, vacuuming, unloading the dishwasher, and so many other little and big jobs. He makes my life easier and happier. I love talking to my son and grandson in Australia, and my stepdaughters and grandchildren just a state away. My brother and sister-in laws also have more time to chat. Even though many like to get away from technology, I love the fact that I can so easily talk/text with old friends and reconnect in a way that just a few years ago was not possible. I have made wonderful new friends in Facebook groups, and many of us also send each other uplifting notes and cards via snail mail. I also found vintage linen, china and glassware sale groups that I did not know existed – such fun! Joys also come in the form of always adding more to my many collections of antiques, especially vintage china and glass. I never tire of it, and such fun traipsing around, looking for additions. I have always loved reading, everything from novels to decorating magazines, flea market make overs, daily devotionals and present day news. Obviously Victoria is my favorite magazine, and I can hardly wait for it to come every month. Small joys always come in a bouquet of flowers, even if I buy an inexpensive bouquet for myself. Add that to decorating for each season and most holidays and much of life is good! Sometimes when a friend or past colleague mentions it, I take joy knowing that I changed a lot of children’s lives as a Speech and Language Pathologist. Of course, there is still not enough time for everything I want to accomplish, but there are great moments in each day to enjoy life and help others. Small things mean a lot — thank you, Phyllis, for beginning this new blog series! I’ll look forward to more posts! Trust God’s Holy Will for my life and staying in the state of Grace which gives peace of mine and knowing that for every mountaintop; a valley will follow and that life is precious as are each and every soul God puts in our path. What a lovely post. I am so looking forward to reading your new series. As someone else mentioned, today’s world has become impersonal. We have become so accustomed to instant this & the constant pings and beeps of our electronics that we fail to notice beauty in silence & simplicity. I, too, love fresh flowers & often treat myself to an inexpensive bouquet from the grocery store. I also enjoy sending & receiving cards & notes through the mail. It’s a simple way to brighten someone’s day. I love the comment from Joan Austen about the gift of old issues of Victoria. I, too, live to curl up with old issues of your magazine, some go back to the original, which I save in my spare room. Curl up in bed or my favorite chair with a nice cup of tea and read through old favorites. Thanks Patricia! I’m happy to hear that you enjoy those old issues too. This is a most beautiful post. Truly it is the “little things” that mean the most. For me, it is my family and then next it would be my home and garden. Especially, my beloved peonies. I am giddy like a school girl when I see them poke their heads through the soil. In our world which seems to be ever more impersonal and mechanical, the “little things” are to be treasured. And, I believe if this is brought to our attention through beautiful blogs such as yours, it will help change our world toward a kinder and sweeter place for all mankind. Thank you for bringing beauty into the lives of so many. Looking forward to your series and wishing you a wonderful New Year! We will walk this journey with you and collectively we will walk in greater peace together. The world will be a better place for this simple small act. Thank you and God Bless. I encouraged my students to learn to enjoy and celebrate the little things in life; a beautiful sunset, trees in the fall, the early-morning quiet when no one else is awake and you are alone with your thoughts just to name a few. I really enjoy the little things in life as they give you something to appreciate every day. It is the little things that brings heaps of happiness and joy in our lives and takes our minds away from the imperfect….even for just a few minutes. In order to encourage and care for those around us, we must first care and love ourselves. I look with great anticipation to these series of blogs! One of the best presents I received last year was a stack of old Victoria magazines that a friend gave me when she was downsizing and cleaning out her house. She knew I collected old editions (and new), so what a treasure! 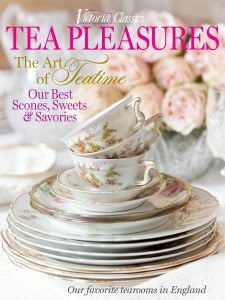 One of my favorite things, especially after a stressful day, is climbing into bed at night with a cup of tea and a Victoria magazine, and treating myself to a hour of loveliness and inspiration – pure bliss! I haven’t worked my way through all the back issues yet but I am savoring each and every one. I, and my siblings, have just lost our 91 year old Mama…whom we dearly loved…this week. Though we are thankful that she no longer is living in a weary body, we miss her. We are so thankful that she and I our Dad made God as real in our home as they were, filled our home with music, and gave us a love for God’s creation. Mama sewed beautifully and could make our clothes and our home lovely on ‘next to nothing’. At Mama’s Homegoing, there was an opportunity for others to share their memories. We kids learned things about our mother’s sharing heart that we did not previously know. We, also, received cards and letters sharing love, scripture and stories that have helped heal much of the sorrow. All of these ‘little things’ that cost very little…if anything…are huge in bringing comfort, peace and joy. I am determined to be a greater ‘encourager’ this year…to do what Hebrews 10:19-25 says we should do to encourage one another. Thank you, Phylis, for valuing the ‘little things’. Oh I’m so excited to read this new blog series! Of course, the small things that children, grandchildren and my friends known and unknown in this blog say and do… are so special. I enjoy reading your thoughts and ideas. What a wonderful sweet and caring group on this “Ribbon”. You are all a blessing in my life! Keep up the good thoughts and ideas. I love reading all! Thank you Phylis for your up lifting words and ideas. When I see I have a ribbon in my journal I know something good is coming. My faith and family are the most important things in my life. There is also card making, tea time,or coffee with church friends. Life is beautiful! Take time to enjoy it. The puffy white clouds in the robin egg blue sky today was a blessing. To treat myself and others with compassion and loving-kindness. When one does that one can face anything in life with grace and dignity. Little things can be big things. Receiving an unexpected note from a friend, finding beauty in the rain as well as the sun, and, for me, my weekly meeting with a faithful friend from church. She listens, comforts and laughs with me all year through. I endeavor to do the same for her. We have been meeting like this for 40 years! This friendship is truly a blessed gift. The most important thing in my life is my little family, just my husband and one lovely daughter. I count my blessings everyday for them and the good health we all enjoy. As to little things of life, I am going to foster more and closer friendships. As we loose our family, our friends replace our family. This year I started with a friendship tea, with ladies from my golf groups, card making groups, and neighbors. The ladies asked, before we said good bye that day, if we could make this a monthly event. What a compliment. So we’re off to a good start. Also this year, I intend to make and write a non-birthday card to at least 3 people each month. People just love handmade cards. It shows you care. As always, you have hit on an idea that is perfect for our times. These are the kinds of things we all need and need to be reminded of: flowers, loved ones, poems, music, laughter. I volunteer to teach reading once a week at a school, and so, at least once a week, I have the very small but most important pleasure of having someone’s small hand tucked into mine, usually with a whispered, “I love you.” A pleasure indeed! Love each season,love sewing,love God,my family and friends, enjoy my job. These things are what make life worthwhile ,beauty, honor,truth are the goals.Looking forward to 2018 ,thank you for everything you do! I, too, think the little things are so very important – using a special fountain pen, elegant notepaper, that favorite perfume, the special bath gel, color folders, special hangers in the closet, monogrammed napkins, the things that define you – usually not much, if any more expensive than a mixture of odds and ends but the attention to details makes all the difference! To me the little things are the big things. A day with diminished pain and fatigue is huge. Being healthy enough to enjoy being with loved ones. Petting fabric. Seeing clearly. Enjoying using possessions of dear ones now gone. A real letter. Corn on the cob. Cuddling my dogs. Reading God’s Word. I could go on and on. Love is eternal. I so agree about enjoying the little things in life…a cup of tea and a good book, a walk along the sea shore, a simple breakfast of hot oatmeal and coffee on a cold a blustery winter morning. Little things can be a variety of subjects. Doing that project you have always wanted to do. It gives you such a feeling of accomplishment. Will be looking for your new blog series. My favorite little things are receiving a letter via snail mail from a friend or relative. There is nothing like snuggling in a comfortable chair and savoring the letter. cannot wait for your new blog series. You know my heart. That is so true!!! I look forward for your inspirational post and your view on enjoying the little things in life. What a joy for me to use the beautiful things I have collected through the years, dessert plates and cups, pretty serving dishes and many things that belonged to my mother. The little things in life are really what makes life fun and enjoyable. The little things are the best. Finally getting time to read that book you always wanted to read. Looking forward to your new series. I consider my faith, family and friends to be the most important things in my life. I do love the little things as well. One time I had major surgery and many people were doing such nice things for me…making meals for my family…running errands and sending me beautiful flowers. One friend made a delicious meal and on the tray she put a simple small mason jar filled with daisies. The simplicity and gesture really struck a cord with me. With her meal and flowers you could easily see that she had really thought about me. That touched my heart in a profound way and I often think of how nice this was. Thank you for such a refreshing post. I have been busy the last week cleaning out my folders in my laptop. I came to the one I keep your emails in and realized I had at least 3 years of your writings and advice. So I started reading these from 2015, didn’t wish to just delete and put in trash, so I got my external hard drive and copied these by year in their own tidy folder and now my lap top just has 3 messages, but I have all the rest stored to read at my leisure. The ones about your sons first cake, the dresses you make for your granddaughter. All saved, I must admit I did delete the one about the Tea Time Magazine and Creative Sewing, as I have hard copies of these. Thank you for focusing on the little things this year. My husband leaves a little love note in my truck every now and again while I’m at work, which I find at the end of a long day. Sometimes is just a torn scrap of paper, but it’s always something that lifts my spirit, and I can’t wait to get home! I look forward to hearing about other small things that I can use to uplift my family and friends. Thank you. This is such a wonderful way to begin a year. To focus on the little things. It doesn’t take much, does it, to add beauty and delight to our days! A little flower in an antique silver cup, a cup of tea in our grandmother’s flowered porcelain, these are the small grace notes that add joy to our daily lives. At the end of the day, aside from these small gestures, what matters most is the people you love, and the time you get to spend with them. If you can do it surrounded by beauty, all the better! In our new home snow plowing and shoveling are included in our HOA. Being able to enjoy the beauty of snow coming down, without having to panic about my dear husband going out to clear it. He has had a heart condition for 37 years. For many this is a small thing, for me the peace of mind is enormous. or something that brings back a memory from long ago. I have learned to love to journal and when I look back I see how much I have grown and am thankful for that. What a thoughtful gift–a flower every week! The little things are indeed the best, as long as they’re appreciated from the heart and not imposed from outside. I think that’s the hard part–really examining what matters to us vs. what everybody says matters and has become ingrained.